Tastata - Works of tablature organ and harpsichord There are 34 products. II revised edition. 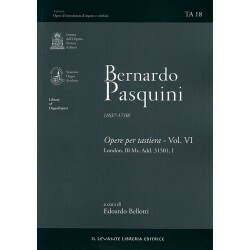 The only instrumental works by this Veneto composer, active in Rome as the Maestro di Cappella in S. Maria Maggiore, better known for his vocal music. 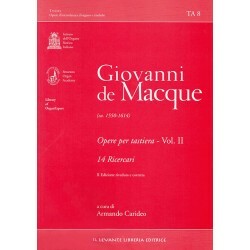 These works have come down to us as a single printed copy in score parts. II revised edition. 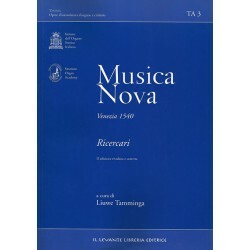 Musica Nova provides the first evidence of the existence of a real Venetian school of instrumental composition consisting of a group of organists around Willaert, the mentor, teacher and chapel master at St. Mark’s. III revised edition. 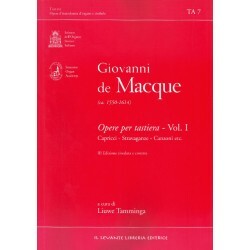 A new critical edition with some new additions of various keyboard compositions found in different manuscript sources by this great Flemish master who lived and worked in Naples founding an important musical tradition. II revised edition. 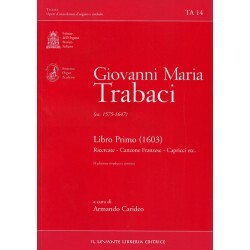 A new critical edition of the well known I Libro di Ricercari (ms. from Florence), following the discovery of an earlier source in German organ tablature, with two ricercari from the lost II Libro existing in several 17th Century sources. II revised edition. The second part of the autograph by B. Pasquini containing compositions already belonging to the new style, among which several large sets of variations. II revised edition. 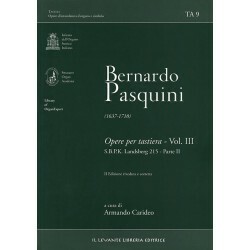 The third part of the autograph by B. Pasquini containing the famous scherzo upon the Cuckoo's verse, other variations and a first series of a set of dances organised into suites. II revised edition. The aim of this edition, conforming to the general purpose of this series, is above all to offer a score that is on the one hand of the greatest possible transparency with respect to the source, and on the orther, a practical usability on the part of the keyboard player. 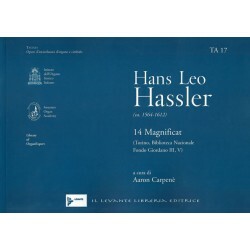 The 14 Magnificat, found in the organ tablatures in Turin, are among the most important keyboard works by H.L.Hassler. 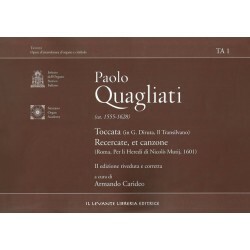 14 sonatas for solo harpsichord (figured bass only) and 14 sonatas for two harpsichords (figured bass only) from the manuscripts, partly in the hand of Pasquini himself, conserved in the British Library. A vast collection of versetti (figured bass only) and various compositions dated after 1703, partly in the hand of Pasquini himself, conserved in the British Library. Two important unpublished manuscripts for Keyboard of the roman Family Pamphilj, from the Middle XVII Century. 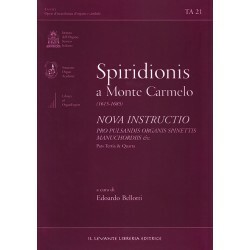 The first modern edition of a didactic work from the second half of the 17th Century, surprising in its content concerning improvisation for the organ, featuring numerous and interesting musical examples, published in Germany and strongly influenced by the Italian style.